Shrule - Page 4 of 6 - Sruthair - "a river or stream"Shrule - Sruthair - "a river or stream"
The Shrule Community Newsletter is now in circulation. This is an initiative of the Shrule Community Council. Our aim in publishing this Newsletter is to create a platform for local news, announcements and developments within our community to be shared and distributed among us all. We hope to distribute an issue every two weeks. The Newsletter will be available in Craddock’s, Headlines, Molloy’s, Mullins’ from 4:00 p.m. every second Saturday & in the Post Office from 10:00 a.m. every second Monday. The cost of the Newsletter is 20 cents. This is to help cover the costs of materials and getting the Newsletter out. You can submit news items, announcements and any other relevant information to the Newsletter by email or in writing by Friday evening for inclusion in the issue the following day. A submission needs to be in before 6:00 p.m. on the Friday evening to make sure that it will be included in Saturday’s issue. Make sure to include contact details with your information. Please note that the length of any announcement or news item should not be more than 150 words. Also note that announcements submitted for activities related to profit making classes or events will be asked to contribute €1 to the Newsletter. The Shrule Community Newsletter will also be available available on this website ..
A group of concerned residents have taken matters into their own hands to deal with the on-going problem of litter in Dalgan Bog in south Mayo. A spate of illegal dumping has accumulated tons of rubbish resulting and the place has now become an eyesore and health hazard for people who save turf and also avail of the recreational advantages of the area. On a five mile stretch of bog road large quantities of used tyres have been dumped regularly at various locations. Other items such as plastic silage wrapping, electrical appliances, bottles, old furniture and, in some instances, dead animals are to be found dumped in drains and watercourses that flow into the nearby Black River. A meeting was held recently in Ballycushion School regarding the dumping issue and locals decided to undertake the clean-up themselves. Villagers in Ballycushion, Carramore, Dalgan, Gurteen and Brackloon came on board resulting in an amazing example of a small community taking active responsibility. Men, women and children from the area have voluntarily answered this mammoth ask over the last few weeks. When The Mayo News visited last week people were busy at work with everyone involved going about their unwanted chore in a good-humoured manner. Despite the nature of the task it still manages to generate camaraderie among the volunteers. Already vast piles of rubbish had been gathered and stacked along the roadside awaiting collection by Mayo County Council. Local councillors Damian Ryan and Patsy O’Brien are lending support to the venture also. Cllr Ryan has tabled a motion for next week’s area meeting requesting the installation of cameras on an ad-hoc basis. Both councillors agree the offenders must be identified and charged before the courts. On Saturday last Michael Monaghan of Ballinrobe Waste provided a refuse truck free of charge to remove and dispose of the waste. Ballinrobe Waste employee Joe Davin, who is also actively involved in the clean-up, gave freely of his time driving the vehicle. Sharon Cameron, Environmental Awareness Officer with Mayo County Council, was loud in her praise of the community. “A few weeks ago I met with Bernie Lydon, Christy Hughes, Mike Acton and Veronica Kelly who were organising a voluntary clean-up of a large illegal dumpsite in their area. 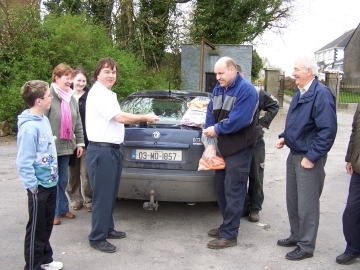 Mayo County Council supported this by providing bags, litter pickers, gloves and the disposal of collected waste. We are delighted to help this wonderful community who undertook this most difficult of tasks. New opening times for the Bookshop / Reading Room are on Saturdays 13:00-15:00. Come and browse the shelves and walk away with some real bargains! No book costs more than €1 because all the books are donated and all the proceeds go to paying for the costs involved in running the service. Additionally, from now we also hope to carry other important information relevant to the community in the Information Hub, which is located in the same area as the present Bookshop – Reading Room. 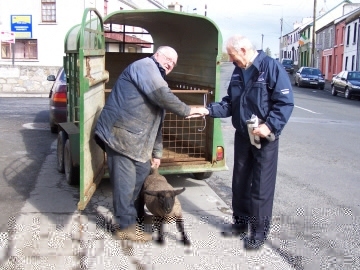 A market was held in Shrule , Co Mayo on the 22 April 2006 . Under the Casual Trading Act 1995 , market rights unused in the 10 year period up to 1 May 2006 could be automatically extinguished . G.Mullen buys vegetables from M.Murphy. Luckily Shrule will not lose the right due to the vigilance of some local marketeers! Market Rights exist for most towns in Ireland and were granted to Town Councils or Individuals over a four hundred-year period by the English Crown. The granting of Market Rights often reflects the bitter power struggles that especially characterised the 17th and 18th centuries. Absolute power was granted to Individuals or Corporations in England’s bid to colonise Ireland and one of these powers was the control and financial rewards of market trading. They were granted “Market Rights” by the English Crown in the form of complex and legally binding “charters” or “letters patent” that encompass special rights under English Law. Ireland’s legal system is based on English Law and so recognises and accepts the primacy of Market Rights. Market Rights that were granted four hundred years ago are still as valid now as they were then and in Ireland have constitutional protection. A “Market Right” is also the publics right to trade in a certain area, at a certain time. In Ireland and England complex laws have evolved in relation to Market Rights and on the whole reflect the general public’s need for the use of a market place .The right exists as much for the customer as it does for the seller.